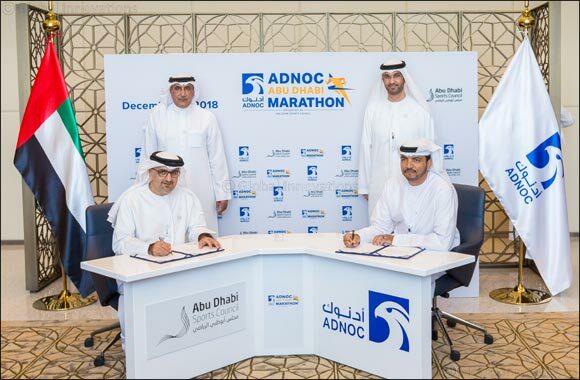 Abu Dhabi, United Arab Emirates – July 4, 2018: The Abu Dhabi Sports Council (ADSC) and the Abu Dhabi National Oil Company (ADNOC) announced, today, the inauguration of the ADNOC Abu Dhabi Marathon, which will be held, for the first time, on December 7, 2018, bringing the world’s oldest race to one of the world’s most modern cities, deepening ADNOC’s commitment to the Abu Dhabi community. A three-year partnership agreement, conferring naming rights for the event to ADNOC, which will serve as Title Sponsor, was signed between H.E. Aref Hamad Al Awani, General Secretary of Abu Dhabi Sports Council, and Omar Suwaina Al Suwaidi, Executive Office Director at ADNOC. The ADNOC Abu Dhabi Marathon will position the United Arab Emirates’ capital city firmly on the global athletics calendar, while promoting wellness in the local community and participation at all levels. Major General Mohammed Khalfan Al Rumaithy, Chairman of General Authority for Sports, said the ADNOC Abu Dhabi Marathon is the latest addition to the ever-growing list of international sporting events to arrive in Abu Dhabi. Dr. Mugheer Khamis Al Khaili, Chairman of the Department of Community Development, praised the efforts of all those involved in bringing the first marathon race to Abu Dhabi. “The races are open for all categories and provides the opportunity for community-participation. The ADNOC Abu Dhabi Marathon is an event that the entire family can appreciate, not only by participating in the races, but by enjoying the various side events at the Marathon Village,” Al Khaili said. The race will be held over a 42.195-kilometer (26 miles, 385 yards) course that will showcase the city of Abu Dhabi to a global audience. In recognition of the Year of Zayed, the race will bring together elite international athletes, seasoned amateur runners and thousands of people taking part in their first marathon. It will offer runners of all abilities the chance to participate in a range of events from 2.5km and 5km fun runs, to the 10km and full-distance marathon. Omar Suwaina Al Suwaidi, Executive Office Director at ADNOC, said: “ADNOC is excited to play a part in bringing such an iconic event, the marathon, to Abu Dhabi. Our partnership with the Abu Dhabi Sports Council is built on a shared commitment to elevating the health and well-being of individuals and embodies ADNOC’s historical dedication to supporting the communities in which we operate. “Whether it’s through sporting and recreation, health and wellness, or youth and STEM education, ADNOC’s corporate social responsibility and purpose remains firm: To create a positive and lasting impact on UAE society,” Al Suwaidi said. Entry fees for the event range from AED 50-75 for the shorter 2.5km and 5km fun runs, AED 150 for the 10km, and AED 350 for the marathon race. Registration for the ADNOC Abu Dhabi Marathon is open at: www.adnocabudhabimarathon.com. The world-record time for men over the marathon distance is 2 hours 2 minutes and 57 seconds, set in the Berlin Marathon, by Dennis Kimetto of Kenya, on September 28, 2014. The world-record for women was set by Paula Radcliffe, of Great Britain, in the London Marathon, held on April 13, 2003. Radcliffe completed the race in 2 hours 15 minutes and 25 seconds.